In North Dakota, there are nearly twice as many licensed practical nurses per 1,000 people than the national average. Most of these LPNs work in nursing homes, extended care facilities or hospitals around the state. In order to assist registered nurses with patient monitoring and bedside care, LPNs must earn a certificate or associate degree and meet all state licensing requirements. 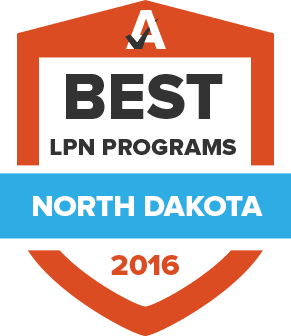 The following guide explores LPN programs in North Dakota, steps for licensure, and career outlook and salary data by region. Those who want to become LPNs in North Dakota can enroll in programs at technical schools, community colleges, and large universities. Potential nursing students can find an LPN program that meets their individual career goals and educational needs. Using the search tool below, aspiring LPNs can compare program options based on tuition, location and school type. Every year, nursing school graduates finish their LPN programs with the hopes of finding a job in the state. But before they can get employment, they must become licensed through the North Dakota Board of Nursing. This section will explore the licensure process, including how licenses are initially granted and renewed. Complete the Application for Licensure by Examination and submit it to the North Dakota Board of Nursing. Those who want to pursue a career as a licensed practical nurse must complete an LPN program that is approved by the Board. For those who attended nursing school out of state, the Board requires that they graduate from a program educationally comparable to those available in North Dakota. Out-of-state programs must include supervised clinical experience that teach students how to provide care across the life span. Pay the required $130 application fee. This can be paid by check, PayPal, or credit or debit card. Arrange to have official school transcripts sent to the Board of Nursing directly. Register for the NCLEX-PN examination through Pearson VUE. Submit fingerprints in order to participate in the state’s criminal background check. LPN licenses are renewed every two years. In order to renew a license, nurses must finish 24 hours of continuing education coursework. When submitting an application for license renewal, LPNs must pay the $110 fee, update their demographic information, and outline the number of hours they worked each year. Licensed practical nurses can make a good living, but, like every other profession, the amount of money they make depends on where they work. Salaries vary from state to state, but they also vary depending on what part of North Dakota LPNs find employment in. The following data outlines the earning potential of LPNs in the state. Employment potential for LPNs in North Dakota depends on several factors, including what part of the state they work in, what kind of health care facility employs them, and what practice area they choose. The following data breaks down the employment for LPNs in the state and exemplifies where the most opportunities are. Includes detailed information on nurse employment, education, and demographics. This site includes a list of IV therapy courses that provide the required education LPNs need to treat patients with intravenous medications. This website lists the LPN programs that the North Dakota Board of Nursing has sanctioned. This page of the nursing board’s website outlines the acceptable continuing education courses that can be taken for license renewal. Provides information on the education LPNs must receive in order to provide IV drugs to patients. Nurses can verify their license, receive information on obtaining a license through examination or endorsement, and find schools sanctioned by the state on the Board’s website. Nurses in North Dakota receive professional development and advocacy services through this association. There is also a career center where LPNs can find job leads. This report includes information about the health care industry from the University of North Dakota School of Medicine and Health Sciences. LPN student enrollment and employment is included. Outlines what is expected of LPNs in the state based on guidelines passed by the North Dakota Legislative Assembly. Includes nursing job predictions by the North Dakota Center for Nursing Research.